Whichever home you choose to visit, or ultimately decide to come and stay in. You can rest assured that not only will the level of care be consistent across the group, but also the levels and quality of facilities provided. Complimenting our high levels of care with the very best facilities available. From the thoughtful way in which all our residents rooms have been designed to be both functional whilst remaining comfortable, to the layout of our dining rooms and our lounges. All aspects of our homes have been built around key facilities that both enhance our residents quality of life whilst providing the very best in care. All our rooms have their own wash facilities, with the vast majority having en-suite facilities, and come fitted with all neccesary digital TV points and telephone access. All residents are welcome to personalise their rooms with any pictures or small pieces of furniture they wish to bring with them. All our lounge areas are very spacious and have digital televisions complete with Freeview. Most lounges provide multiple seating areas allowing residents to sit in a quieter area away from any televions etc. for some more quiet time. All our dining rooms are layed out in such a way that interaction and socialable conversation is encouraged during meal times. We use Nurse Call systems throughout all our homes, eliminating the need for lights and buzzers which can disturb and upset residents. 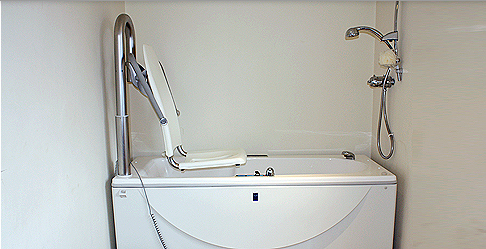 Power assisted bath and shower devices helps ensure bathing is made as easy and as comfortable as possible. Our homes have their own laundry situated in-house which is staffed 7 days a week. We do ask that laundry is marked prior to admission to avoid loss. All our homes have large professional kitchen which allow us to provide healthy and nutritional meals to residents throughout the day and night. Having our own transport allows us to easily and quickly arrange outings, hospital and day trips with minimal fuss and planning.